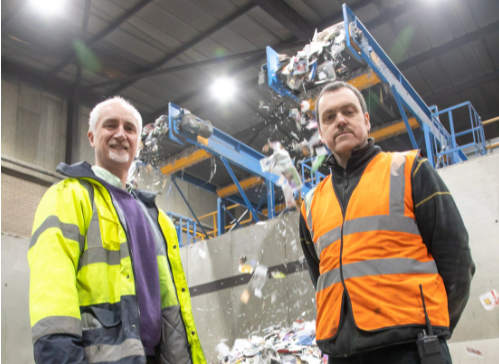 A Leominster-based multi-disciplinary design agency has completed its latest recycling plant project – one of its most advanced to date. Grove Design, which employs eight people at its bespoke offices in Pembridge, has worked in partnership with equipment supplier Lyndex to design and install a £3m dedicated mixed paper sorting operation for Allan Morris Recycling. Five designers were involved in the contract that took just eight months from initial analysis, feasibility and identifying the technology involved, through to optimising flow through the plant and the successful build of the line. The aim was to process kerbside collections of fibre, taking out all the different contaminants to produce a product that is clean enough to be used as the sole raw material in the production of new paper. “This is the eighth recycling plant build we’ve been involved in over the last few years and by far the most significant fibre plant, with a number of challenges to overcome,” explained Austin Owens, founder of Grove Design. Carl Robertson, who left Biffa Waste after 25 years to set up the Allan Morris Recycling plant in 2008, added his support: “Grove Design spent time on site understanding our current operation and how we could maximise the site with new equipment. Grove Design is a multi-disciplinary design consultancy, supporting customers with the development of industrial tools and equipment to automotive transmission systems and waste recycling plants. It is increasingly supporting manufacturers and innovators with prototyping and the automation of production lines, whilst its design expertise is called upon to work on some of the most intriguing new consumer market products. The engineering design agency is also a crucial member of the Manufacturing Assembly Network (MAN), a nine-strong group of sub-contract manufacturers who work together to win orders and share best practice and resource. Its membership includes Alucast, Barkley Plastics, Brandauer, C-MAC SMT, Kimbermills International, Mec Com, Muller Holdings and PP Control & Automation.